(Detailed move in instructions will be sent 1 week prior to the show. OPTION ONE: I will move myself in (any time between 12pm-3:30pm). OPTION TWO: I need help moving in. Enter your move in time preferences below. If you chose OPTION TWO - enter your 3rd choice move in time between 12pm-3:30pm. 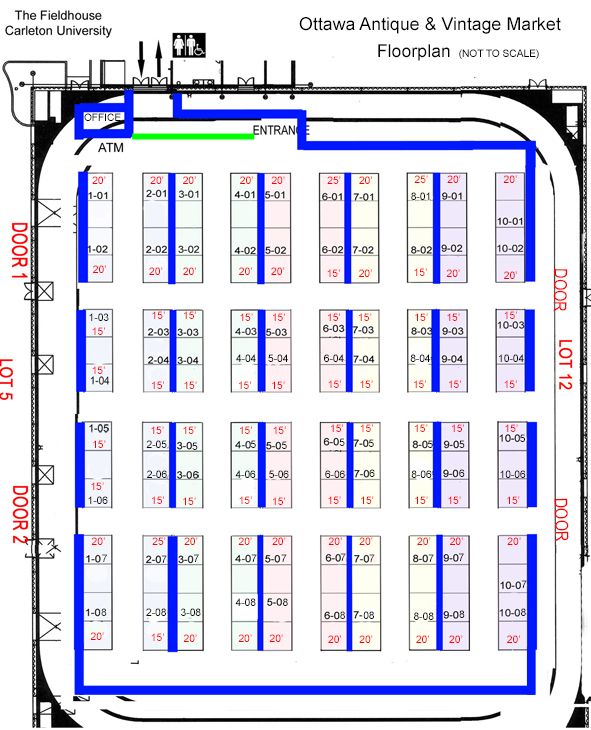 FLOOR PLAN - PLEASE NOTE BOOTH DIMENSIONS TO ENSURE YOU ARE PAYING THE CORRECT AMOUNT. Timed unloading (with handlers) will take place on Friday from 12pm-3:30pm. If you do not require a handler - you can move in on your own (dollies available) from the parking lot on the east side of the building (lot 5) anytime between 12pm-3:30pm. DO NOT PARK IN LOT 12 ON FRIDAY - YOU WILL BE TICKETED. The rental tables come in 3 sizes (4'/6'/8') and are 30" wide. The skirted tables have a white vinyl top and black skirting on 4 sides. The unskirted tables are raw wood - you must supply your own tablecloths (fire treated). No undraped tables are allowed. You can bring your own tables & tablecloths. Carpet pads MUST be used beneath all table legs to prevent damage to the carpet. These are provided during show set up (stacked in the middle aisle of the show). There will be white drape (8’ high) along the back of the booth. We have a limited number of Schadebo display cases available – they must be booked with your reservation. A 500 watt electrical supply is included with your booth rental. There is a weekend parking pass available. See reservation form to order. The Ottawa Antique & Vintage Market has almost 9,000 followers on Facebook. Let us know what special items you are bringing and we’ll promote it on Social Media.